Writings and reflections on life, the pleasures in life and the pursuit of pleasure. Nicolò di Pietro, Virgin and Child, tempera on panel, 1394, 107x65cm., Venice, Accedemia. 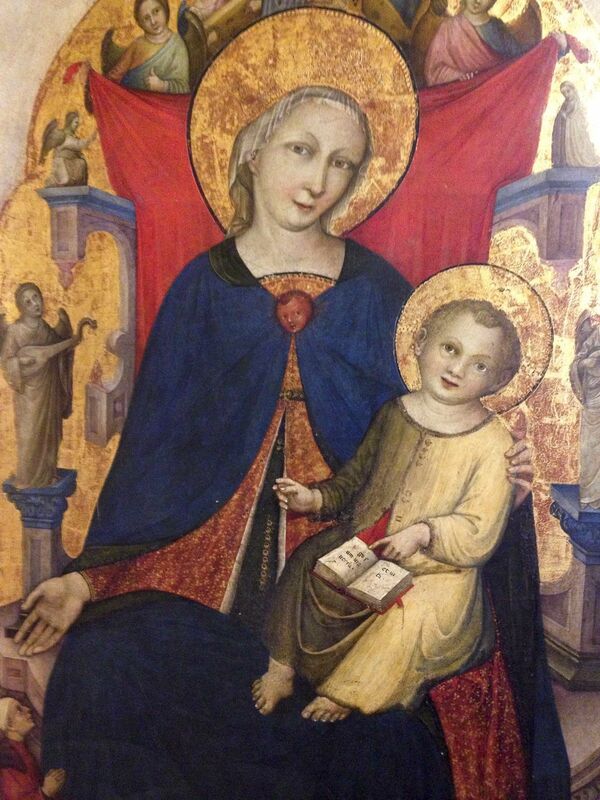 Again from the Accademia today, this image of a woman who really seems extremely nice & openhearted to me, in a way I think of a being particularly Italian, despite her blond hair, & being 600 years old, & with a quite happy, if slightly goofy, child. Apparently he's learned to read quite early, as he naively points out to us; but perhaps that's because he was encouraged, which is pretty much what I want to say here. I'm sure he was; and I'm sure they talked about it, endlessly. Italians constantly talk with their children; and no, that's not a little thing; it's one of the wonders, certainly one of the charms, and one of the explanations, of Italy. I can't take a walk without seeing this. Along the Fondamente Nove, cold wind, it's early March; still the family coming toward me will have a couple of little things, bundled up like down bolsters with little automatic legs at the bottom and bright-eyed little faces at the top, dragged along nicely but firmly like pull-toys, piping away the whole time, and being answered thoughtfully by their parents; just as thoughtfully as their parents would respond to anyone else of any other age. It dawned on me how important this was when it suddenly occurred to me that I had had an Italian childhood; a curious thought for an American whose family arrived in 1681 from Dublin, whose father was born in Stillwater, Oklahoma, and whose mother was from Bismarck, North Dakota. Not promising Italian heritage. With exactly the exception that matters: we talked all the time. We started before I was a year old, and we never stopped. It was a quite conscious issue with my parents that I always be included, or at least know that I was welcome to inclusion, in any conversation, even those between my parents and their friends, which were at a pretty high level. Did this "spoil" me? Exactly wrong. I didn't think I had anything exceptional to say; I didn't think conversation should stop when I chose to speak; I just piped up, as Lord knows I still do, given the slightest opportunity, because I took it for granted that I was just a natural part of the conversation; nothing more, but far more importantly, nothing less. It's hard to imagine a more important gift to give to a child than this, particularly when I consider some of the people the most important to me in the world who were not given this, and then am forced to see what the lack of something so apparently simple has actually cost them so many years later. It's really a lot; and it's so stupid to deny it; and it's so huge; it should never happen. That's why it's so nice to go to places like the Accademia, and be left undisturbed in the midst of rampant genius; it lets you think.